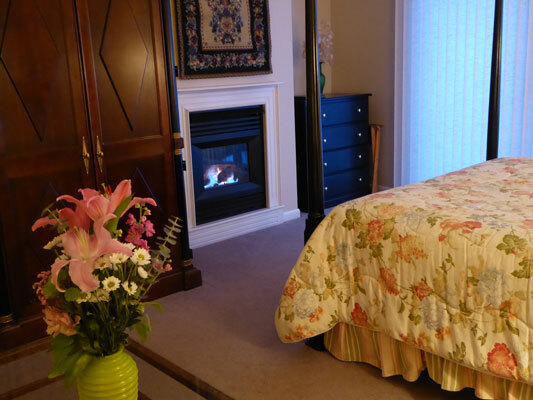 Traditional furnishings with a contemporary update are used in Room 7 at the Birch Ridge Inn. A queen sized four poster bed greets you when you enter the room. The bed is a rich mahogany with black spindles. Matching marble topped bachelor chests with pull out writing tablets compliment the headboard. Antique ceramic lamps are used as accents. Beside the bed, you will find a sliding glass door. The door opens to the back of the inn, into a private area surrounded by deep woods. In the summer, a green canopy provides solitude, only to come alive with color in the fall. During winter, the beauty of snow falling into the forest is very tranquil and peaceful. Complementing the bed, a mahogany armoire is used as Room 7's closet. It sits near the foot of the bed, beside the fireplace. Over the fireplace, Mary has put a hanging tapestry as a room accent. Room 7 also features a very large bathroom that is equipped with a rectangular 6 foot 2 person whirlpool tub. The tub also has an integral shower. Crystal lamps are used in the bathroom. Room 7 is one of the larger rooms at the inn. In addition to the bed, you will also find a love seat with a glass art deco coffee table at the opposite end of the room from the sliding patio door. Over the love seat hang Chinese silks. Bill acquired the silks on one of his trips to China while he was in international marketing for Motorola. Of course, the room is also equipped with complimentary WiFi internet access, an alarm clock with usb charging port and a HD television. As is the case in most of the rooms at Birch Ridge, the television is completely hidden from view when you enter the room. Your entire visit could be spent without even knowing that it is there. 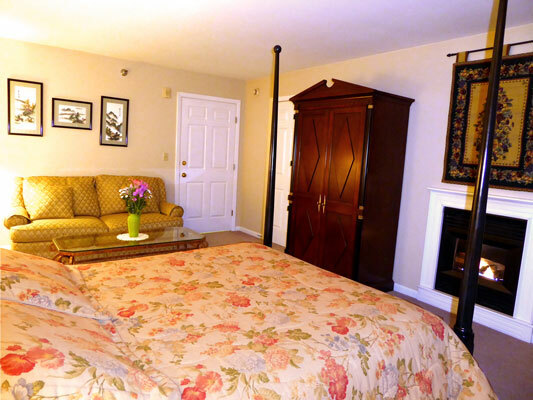 Use our Room Rate Calculator and start planning your trip to Killington and your stay in the Traditional Room at the Birch Ridge Inn.